Verdejo has taken Spanish white wine lovers by storm over the last decade, competing with, and often times dethroning, the more aristocratic Albariño on many a wine list. Lavish ripe fruit and sweet herbal notes on the nose pleasantly deceive drinkers when they taste the wine’s remarkable dryness and refreshing acidity. This is rounded off by a more generous mouth-feel, compared to the often austere minerality of Albariño. Verdejo’s native home lies in the region of Rueda, whose northern limit just brushes the Duero river, although the majority of her vines are further south along the Duero’s tributaries, all within a two-hour drive of Madrid. Rueda is especially blessed with significant crops of pre-phylloxera vines in the province of Segovia. For centuries, Verdejo-based wines were given the name Dorado (Golden), and were similar in style to fully oxidized Sherry, partly in an effort to reproduce Spain’s greatest wine of the day. Dorado’s fame even reached the royal court of Isabel and Ferdinand in the late 1400’s. Verdejo lent itself to this style of wine as it started to oxidize much faster than other white grapes once it was picked, and up until the 1960’s, this lightly fortified style was still easily found in the region. In the 1970’s however, Verdejo’s potential for making aromatic, crisp, dry white wines was spotted by the Rioja winery Marqués de Riscal, with the famous French oenologist Emile Peynaud as their adviser. Peynaud promoted modern techniques now taken for granted with quality wines: nighttime picking and nitrogen use to protect the juice from oxidation, along with cool ferments in stainless steel. Like neighboring Ribera del Duero, Verdejo also benefits from Spain’s high-altitude Meseta Central, with vineyards planted at nearly 3,000 feet ASL. This elevation mitigates the area’s warm continental climate via cool nights, where temperatures drop by up to 40 degrees F.
The combination of high altitude sunlight and vast temperature differences, means that Verdejo can fully ripen both her grape sugars and phenolics, while maintaining acidity, freshness, and delicate aromas. Peynaud declared that for all these reasons, Verdejo would become one of Spain’s star white grapes. And a star it became! So much so, that Verdejo is now a victim of its own success, and the grape described in the opening paragraph is the exception rather than the rule. Plantings of the grape have more than doubled in recent years, flooding the market with dilute, flabby wines made from immature vines and high yields. But for 2 Euros a bottle, many restaurants and bars couldn’t be happier, as they charge at least as much for a glass. Newcomers to the grape must wonder what all the fuss is about. Enter producers such as Javier Sanz, a man who represents four generations of grape growers-turned winemakers in the town of La Seca, Valladolid in the heart of Rueda. This small family winery, whose 14 employees are all warmly profiled on the company website, manages 250 acres of estate vines to produce their eight wines, six of which are Verdejo-driven. A recent addition to that group of six is Malcorta, one of four new wines from Javier Sanz (see above), all grouped under the category Colección V, (V for Viticultor, i.e. vine grower, or owner of a vineyard). The goal of the new collection is to cultivate older and practically abandoned clones of local grapes. The name Malcorta refers to an almost extinct clone of Verdejo from which the wine is made. Due to its longer hangtime and later harvest dates, the Malcorta clone gave grape growers fits in the past before the influx of modern wine making techniques. Today, the longer hangtime offers several benefits: a slower ripening of the sugars (i.e. higher natural acidity + lower alcohol = greater elegance), and an even further development of aromas, as the phenolics in the skins are allowed to reach full potential. Bright lemon body showing tarragon, fennel, ripe apricot and tangerine on the nose, as well as a dusty note of compact earth. On the palate, the citrus-herbal combination is maintained, with notes of pineapple as well. It’s medium in body, with a long bright finish helped by higher than average acidity for Verdejo, balanced by that lovely ripe fruit. 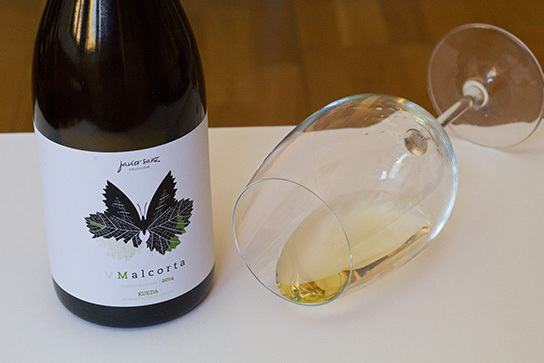 Javier Sanz Malcorta offers much more character than most Verdejo wines on the market, and is well worth its price tag of 15 Euros, proudly showing us what real Verdejo is capable of. Mesón Los Rosales – This delicatessen/wine shop is a recent arrival in the Neighborhood of Letters, but has a carefully chosen selection of Spanish wines at reasonable prices, along with other gourmet products. Open 10am-10pm Monday-Saturday – Calle Echegaray, 17 – Tel. 914557365 – Metro Sevilla (Line #2) or Antón Martín (Line #1). La Antoja – A charming delicatessen, convenient for those near the Reina Sofia museum and the Paseo del Prado. Open during market hours Monday – Saturday – Mercado San Fernando in Lavapiés Calle Embajadores, 41 – Tel. 915276370 – Metro Lavapiés (Line #3). *Photo of the Javier Sanz vineyards and Colección V wines courtesy of the winery’s website.